Dos Rios Consultants, Inc., with funding provided by the National Park Servic and administered by the New Mexico Historic Preservation Division, has completed a state-wide overview of New Mexico's hard-rock mines. The report goals were twofold. First, the report provides researchers and land managers with a broad historic context suitable for assessing the historic significance of minine properties across the state. Second, the report identifies types of mining properties bases on analyses of about 3,000 known mines, and contains priorities and guidelines for managing historic hard-rock mining properties. The report consists of five chapters. Chapter 2 focuses on the advent and chanracter of mining in the eighteenth, nineteenth, and early twentieth century. Chapter 3 examines regional, national, and international factors causing fluctuations in the production of precious and commodity metals. Chapter 4 explores the appearance and impact of technological innovations in New Mexico's mining industry. Chapter 5 provides county-specific summaries of mining properties including dates when mines were first established, the character of early mine operations, and the occurrence of mine-related features at individual properties, all augmented by significant numbers of early photographs culled from the USGS archives. Chapter 6 presents strategies for identifying and managing historically significant hard-rock mines in the state. NOTE: The Historic Preservation Division announced today (4/25/00) that this volume has been reprinted and is now available for $16.00. Copies of the report can be obtained by calling 505.827.6320. NEW! If you're cheap like us, you may not want to pay $16.00 for a single hard copy. This report is now available on CD--giving you original first quality graphics and photos--for the princely sum of $18.00 + $3.00 S & H. So cut a check for $21.00, payable to Dos Rios Consultants, and send it to P.O. Box 1247, Silver City, NM 88062. We'll send it out with alacrity! For other examples of our mining research, see more mines. Here is a nice bibliography of basic source materials regarding the history of mining in New Mexico. As you might expect, the focus here is on older source documents. Some of these sources are very hard to find, but most are available from the library at New Mexico Tech in Socorro, the motherlode of all mining literature. Feel free to download this as needed and work that inter-library loan system! We are pleased to provide for your research needs a complete index of all mines-- including hard-rock, coal, uranium, and gravel pits--in New Mexico. These are organized by county. Simply click the county-specific index and print what you need. We're continually amazed at what we stumble across when rummaging through the trash heaps of time. So who, you might ask, appeared on the long-neglected film in the canisters we found in the fall of 2002. To find out, see the Vitaphone Project. We're toward the middle of the newsletter. . . Boy, howdy, is it tough to find historical data about the values of precious metals! Nevertheless, we've managed to locate some data for gold prices in the US between 1792-1998. After looking at these numbers, it makes you wonder why anybody invests in this stuff. In case you're wondering, we've been using these data to model interactions between prices, ore production, and occupation intensities at Mexican and American period sites in New Mexico. As promised in July, we have uploaded silver prices between 1792-1998. Check out the surge in silver prices in 1979. Why, the sudden jump, you ask? Why, this was when the Hunt Brothers tried to corner the silver market! OK, it is October, so it must be time for copper prices. Quite frankly, gold, silver, and copper are the holy trinity of Western mining and we're worn out hustling down this information. If you want something more mundane, like lead or zinc, you'll have to find other metal prices on your own. Oh, OK, here's a few more prices for your amusement. But really, no more! This industrial archaeology can be a puzzler! Now take spark plugs, for example. We find ourselves hip deep in these things from time to time, but, as near as memory serves, these artifact types were not covered by our archaeology courses in grad school. Nevertheless, in our continuing effort to broaden our horizons (and hopefully yours), we have put together a little guide that will let you seriate those spark plugs! From time to time, we all need a quick listing of maker's marks (hallmarks) commonly found on bottles from historic sites. If you wander over here, there is a nice index for your perusal. We've been doing considerable work on these historic mines lately. Oftentimes the remains from these sites have artifacts with patent numbers that can be useful in establishing when sites were occupied. For your edification, you can download an index of patent numbers organized by year (since 1836) to help you with your analyses. Identification of glass bottle fragments can be frustrating since it is hard to match partial letter strings with most of the books currently available. In an effort to avoid being stymied any longer, we are pleased to provide for your use a computerized index of primary labels for hundreds of patent medicine bottles. We've just been turned on to what has to be the most comprehensive index of bottle makers in our region. Compiled by William Lockhart, the book Bottles on the Border: The History and Bottles of the Soft Drink Industry in El Paso, Texas, 1881-2000 is highly valuable to all those working in West Texas and southern New Mexico. Be forewarned, however, you need to have a ream of paper on hand should you decide to print this massive work. Firearm cartridges are often recovered from historic archaeological sites. Standard guides to headstamp identification, notably Henry P. White and Burton D. Munhall's Cartridge Headstamp Guide (1977), can be used when headstamps are present. However, early cartridges frequently lack any identifying headstamps, forcing one to rely instead on measurements in an effort to identify the caliber. To automate this process, we are pleased to provide for your consideration a computerized index of cartridge measurements that greatly simplifies the identification process. Some visitors have requested that we provide a quickie guide to firearm cartridge headstamps and production periods by cartridge makers. This is more complicated than it sounds. A basic bibliography of headstamps is available. However, the White and Munhall volume alluded to above is long out of print and, at $100 a copy if you can find it, there are limitations. As an interim step, we point you to this link for a glimpse of what is available for general cartridge manufacturers. Alternatively, visit this site for a more detailed guide to shotshell headstamps. I cannot vouchsafe the accuracy of all these data, but the ones I am familiar with coincide with production dates that I know to be accurate. We recently had occasion to be rummaging about in the attics of some old houses that were about to be demolished. Stumbling across some old dry-cell batteries for hand-crank telephones, we found ourselves scurrying about trying to seriate the logos on these items. 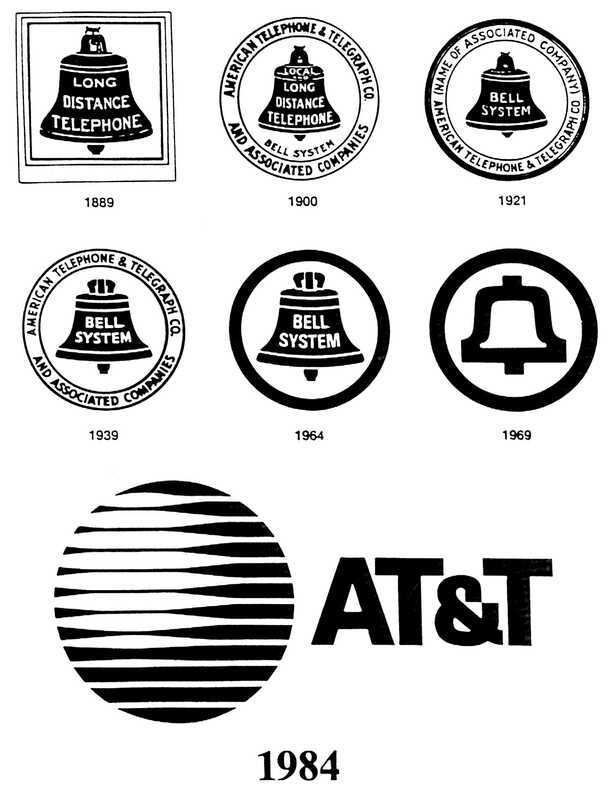 We though we'd share our Bell logo seriation in case you find yourself in a similar situation. However, we recommend that you avoid attics in June!. Ah, it is comforting to know that sweet tooths abounded in the past! We have garnered an attribute summary from Hershey Foods Corporation that will let you seriate those Hershey Cocoa tins! Our thanks to Pamela Cassidy for providing this information.